← ABC #1 Broadcast Network Saturday. ‘Big Ten’ Football #1 Broadcast Program. TBS #1 Cable Network. ‘MLB ALCS’ #1 Cable Program. NBC #1 Broadcast Network Sunday. ‘Sunday Night Football’ Top Broadcast Program. TBS #1 Cable Network. ‘MLB ALCS’ Top Cable Program. Football and Baseball dominated viewing on television on Sunday. The Daily Diary Of Screens #dailydiaryofscreens 🇺🇸🇬🇧🇦🇺💻📱📺🎬﻿🌎﻿. For Sunday, October 14, 2018. This is your U.S. Daily Television Ratings Platform. 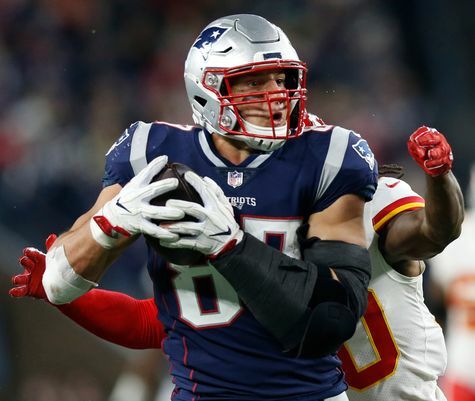 In the U.S., NBC #1 broadcast network Sunday in prime time as Sunday Night Football‘ featuring Kansas City Chiefs vs New England Patriots was #1 broadcast program with an average 18.254 million viewers. In the U.S., TBS #1 cable network Sunday in prime time as ‘MLB ACLS‘ featuring the Houston Astros defeating the Boston Red Sox was #1 cable program. 7P ‘Football Night In America’ finished with an average 8.885 million viewers. 8P ‘NFL Pregame’ finished with an average 16.126 million viewers. 830P ‘Sunday Night Football’ finished #1 program in prime time Sunday with an average 19.339 million viewers. 9P ‘Sunday Night Football‘ finished with an average 18.649 million viewers. 10P ‘Sunday Night Football‘ finished with an average 17.316 million viewers. 7P ‘NFL Overrun‘ finished #1 in the time slot with an average 16.391 million viewers. 730P ‘60 Minutes‘ finished #1 in the time slot with an average 11.763 million viewers. 8P ’60 Minutes’ finished with an average 10.807 million viewers. 830P ‘God Friended Me’ finished with an average 7.942 million viewers. 9P ‘God Friended Me’ finished with an average 8.047 million viewers. 930P ‘NCIS:Los Angeles’ finished with an average 7.396 million viewers. 10P ‘NCIS:Los Angeles’ finished with an average 7.297 million viewers. 1030P’Madam Secretary’ finished with an average 5.590 million viewers. 7P ‘America’s Funniest Home Videos’ finished with an average 5.692 million viewers. 8P ‘Dancing With The Stars:Juniors’ finished with an average 4.573 million viewers. 9P ‘Shark Tank’ finished with an average 3.686 million viewers. 10P ‘The Alex Baldwin Show’ series premiere finished with an average 2.171 million viewers. 7P ‘The Simpsons’ rerun finished with an average 3.184 million viewers. 730P ‘The Cool Kids’ rerun finished with an average 2.175 million viewers. 8P ‘The Simpsons’ finished with an average 2.509 million viewers. 830P ‘Bob’s Burgers’ finished with an average 2.052 million viewers. 9P ‘Family Guy’ finished with an average 1.930 million viewers. 930P ‘Rel’ finished with an average 1.352 million viewers. 8P ‘Supergirl‘ season premiere finished with an average 1.526 million viewers. 9P ‘Charmed’ finished with an average 1.541 million viewers. 7P ‘MLB ALCS’ featuring the Houston Astros vs Boston Red Sox finished as the top cable program in prime time Sunday. NBC finished #1 broadcast network Sunday in prime time with an average 15.646 million viewers, UP +3.491 million viewers (+26.1%) vs SD 2017. CBS finished with an average 9.404 million viewers, DOWN -1.433 million viewers (-13.5%) vs SD 2017. ABC finished with an average 4.031 million viewers, UP + 539,000 viewers (+15.4%) vs SD 2017. FOX finished with an average 2.200 million viewers, DOWN 300,000 viewers (-12%) vs SD 2017. The CW finished with an average 1.534 million viewers. N/A. The CW did not broadcast on Sundays in 2017. Broadcast network viewership Sunday in prime time finished with 32.815 million viewers, UP +2.851 million viewers (+9.5%) vs 29.964 million viewers SD 2017. This entry was posted in #dailydiaryofscreens., Audience Analysis, Audience Behavior, Audience Management, Broadcast TV Ratings in US, Cable TV Ratings, Cinema, Daily TV Cable Ratings, Data, Digital, Direct, Marketing Notes, Media, Media Analysis, Media Management, Mobile, Social Media Note, Sunday Night TV Ratings, Television Ratings, Uncategorized and tagged 'MLB ALCS' #1 cable program Sunday 101418 in prime time, 'Sunday Night Football' #1 broadcast program Sunday 101418, Boston Red Sox TV Ratings Sunday 101418, Broadcast networks Up 9.5% Sunday 101418 vs SD 2017, CNA|SOPHIS, Houston Astros TV Ratings Sunday 101418, Kansas City Chiefs TV Ratings Sunday 101418, Lance Hanish, NBC #1 Broadcast Network Sunday 101418, NBC & ABC only Broadcast networks UP vs SD 2017 on Sunday 101417, New England Patriots TV Ratings Sunday, TBS #1 Cable network Sunday in prime time 101418. Bookmark the permalink.